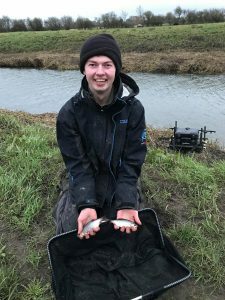 Still scratching my head regarding where to go for this league, I decided to try the free water on the Parrett at Muchelney, similar to the match we had at Midelney, we obviously couldn’t close the water or peg it so we would just turn up on the morning. 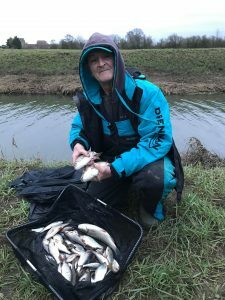 I popped out to have a look on Saturday and Terry ‘The Toast’ came with me, it was fairly uniform apart from one swim that had a bush on the far bank, we didn’t see any fish top but it looked like it had a nice depth and I couldn’t wait. What wasn’t so nice was all the piles of dog crap everywhere, some people shouldn’t be allowed to have pets! We met for breakfast and it was nice to see Karl and Stu Aplin back again, with our bellies full, we headed to Muchelney and although there were several pike anglers below the bridge, there was nobody upstream. We decided that peg 9 would be the first peg above the bridge and the swim with the bush would be peg 1. I announced the draw and people started pulling their pegs and heading off, with just me and Karl left, I asked Adie to draw for me and he handed me number 9 – ideal! and Karl ended up on peg 4. Obviously bridge pegs are normally really good but I also fancied the bush peg and to be honest, it was all pretty much an unknown quantity. I do recall Chard fishing a match here years ago and I think it was won with around 6lb and most people caught small fish and Fieldy said he’d caught some skimmers/bream when he’d fished it many moons ago. I was looking forward to this! Rigs for today were a 1 gram bodied float to fish two thirds of the way across and also a 1.5 gram DH13 bodied float to fish four sections to hand. On the side tray I had casters, maggots and Bait-Tech Super Seed Hemp plus some Pro Natural Fine Lake Dark and Pro Nat Bream that I mixed the night before. As Nick had brought his whistle with him, he got us underway at 10:15, I cupped in three balls of groundbait at 10 metres before starting with the lighter rig with single red maggot on the hook. I inched the float through but it didn’t go far before it shot under and a rather pleasing amount of Drennan Aqua elastic came out on the strike, I shipped back and netted a nice roach of 3-4oz. Next chuck, the rig had barely settled before the float went under again and another roach was added to the net. I had eight fish in eight chucks (including a 6oz chublet and a little silver bream/skimmer/hybrid thingy) before I bumped one so there were obviously a few fish there and I decided to try the heavier ‘to hand’ rig. Steve P next door had a couple of small fish and then hooked something that pulled a fair bit of elastic came out and he netted a nice chub of a pound or so. Terry ‘The Toast’ was a getting a few on the whip but I couldn’t see how anybody else was doing. 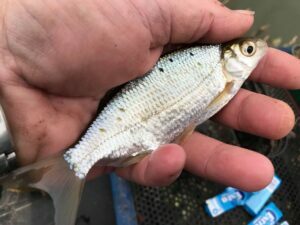 Feeding hemp and caster with single red maggot on the hook, it was a fish a chuck, mainly roach between 1-3oz with the odd netter and I also had a little dace. After an hour I had 42 fish for around 5lb, Steve P had landed another chub and there wasn’t much between us at this early stage. Fieldy walked up and said the top five pegs were really struggling with Dave on the bush peg, the only one to catch with a small roach. Going into the second hour I was still catching well and tried caster but missed a few bites and bumped a couple of fish so went back to maggot. I added another 30 fish including a 6oz chublet and I started to think a really big weight was possible. My catch rate remained at the same sort of level during hour three and I was catching roach along with some more hybrid thingys, another dace and even added a nice rudd. I was catching in spells and sometimes flicking the rig out past the feed would result in a couple of fish, I was also feeding a little nugget of groundbait every other chuck. I did bump what felt like a good fish and when I checked the maggot had gone over the point of the hook. Every now and again, fish would scatter down by the bridge so there were obviously some pike about and I was sure one would grab a fish at some point. Terry hooked a big fish and did well to land a good chub on the whip and Nick above him also had a chub along with a few small fish. Karl came for a wander and said Dave was still the only angler to catch in the top five pegs and it was like two totally different stretches of river! 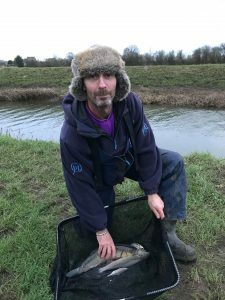 I was still feeding hemp and casters at 10 metres and with around an hour to go and Steve starting to catch a few more fish, I went back across with the lighter rig and had a nice roach straight away but it wasn’t as prolific as I thought it would be. I took a section off and had another chublet followed by a 4oz perch but it was short lived so I went back on the shorter line for the remainder of the match. Terry landed another big chub on the whip and not long after Steve had his third chub, I reached 160 fish with 30 minutes to go and thought I must have 20lb if they averaged 2oz apiece but I actually thought it might be quite a bit more as I’d landed quite a few and swung lots of roach I probably shouldn’t have! On the whistle, my clicker was reading 172 fish, just a lovely day and no pike trouble at all! We started the weigh in with Dave who had 2oz (mainly small fish) and then Stu hadn’t caught, Adie had a perch for 1oz and Karl had two roach for 6oz! 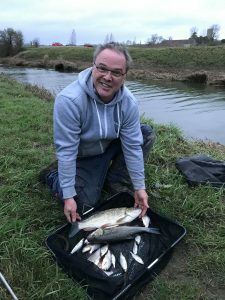 Then Fieldy had 1lb 14oz before Nick had some nice chub and a few small fish for 4lb 11oz and Terry had two big chub plus roach for 7lb 11oz. Steve P was next and he had three chub and some decent roach (plus a couple of ruffe!) 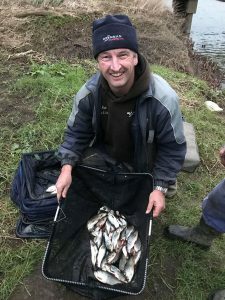 for 9lb 1oz, I was last and after three weighs, my total was 21lb 12oz, a brilliant days fishing but I honestly thought I had nearer to 30lb but I think those little hybrid thingys are deceiving and look 3-4oz when they are actually only 1-2oz apiece. Still a cracking days fishing and with the superpool I had a nice pick up of £75 plus a pound from Steve P was the icing on the cake. 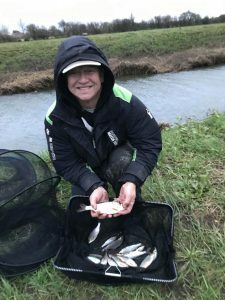 Now, even though I’ve had a lovely days fishing I was gutted for the lads on the top four pegs, I know there is no such thing as a completely fair venue but I was really hoping everybody would catch a few fish. 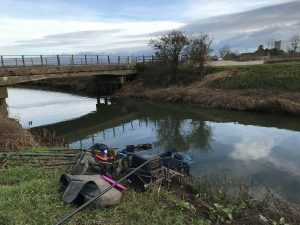 I just don’t really understand it, on these fairly straight venues like Muchelney, Midelney, Stathe and various canals, the first few pegs above bridges seem stacked with fish whereas the rest of the stretch is devoid of fish. There are lots of theories why this happens, from the bridge providing cover/refuge from predators to it’s where most pleasure anglers go so it’s where all the bait gets chucked in, I don’t profess to know all the answers but it does raise some interesting questions. Take today for instance, as the light started to go in the last hour, people started catching more fish (nothing unusual there) but people who hadn’t had a bite all day were getting odd fish so were they there all day and not feeding? or did fish start moving up from the bridge as the light faded, giving them extra security? Then you have Isle Brewers where the swims either side of the bridge are really good but then so are swims like 123 and 129 which are a long way from the road, maybe it’s to do with cover or features then? I’m not sure that’s necessarily true either as at Hambridge there are loads of features and bends further upstream and downstream of the bridge but it’s only the two pegs either side of the bridge that are producing fish at the moment. Then there’s Redbridge where the bridge theory doesn’t really apply so why not? Answers on a postcard please! Next: Next post: All about the money?